Join the world’s first youth football network: share your legend! 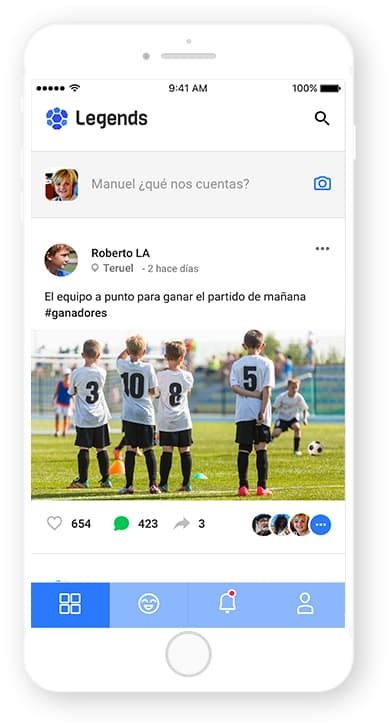 The first global football-focused app serving as a social network for football players on training who want to show and share their talent and connect with each other – the app becomes a window for players to display their careers. Legends allows users to create their own football profile, a kind of digital file where football players can enter their own stats (games played, wins, goals, assists, steals, etc.) and progression. Users can update their profile information at any time after a match, feeding their career history in the app. Their information can be checked by other users and shared on social media. The app allows users to interact with each other and to create communities within the app, by reacting to other players’ publications and statistics or by making comments and sharing content.